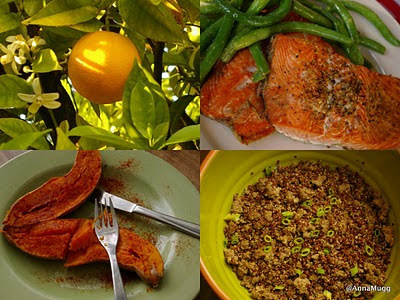 Tips and Gadgets: Super Powerful Foods! You probably heard about the wonders of some kind of foods. Their power may reside in the mineral or vitamin content. The anti-aging factor of some other super-duper-foods is the one that makes them so special. And their uniqueness also can be just the amazing amount of protein that one plant boasts, even more than some well known sources of protein. But for me, besides all of those precious nutritional elements, the flavor and what I call "cooking potential" also counts a lot on the choice. Here's a list of my favorite super foods, links for further reading and some recipes that include them! Almonds - Vitamin E, Calcium, Folic Acid, anti-oxidants. You - or they - name it. Almonds are one of my favorite snacks, and slowly I am adding them into lots of dishes in my home. Also we are recently using Almond Milk in my husband's diet which excludes dairy. 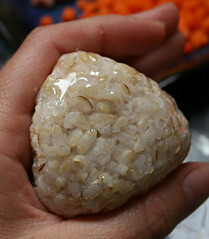 It is delicious and it is said to lower cholesterol. Blueberries - Want to grow old without going old? Blueberries are your best friends on the long run. Kids love it, so you'd better be happy with those miraculous berries. Livestrong says that nothing else works as a prevention against many possible diseases in life. 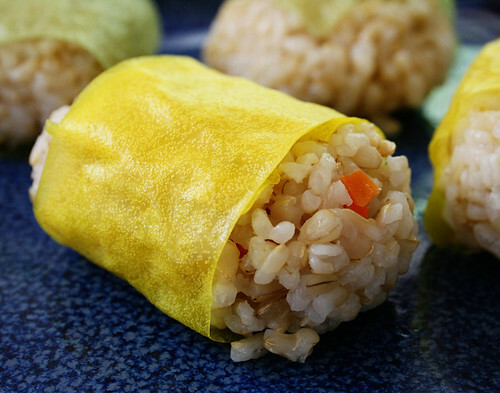 Here's one cute recipe to celebrate its powers. Broccoli _ Vitamin C, plus Vitamin C and more Vitamin C. The beautiful broccoli has lots of fiber and brings just goodness to many dishes : no cholesterol, sugar or fat. I always have plenty of it in my refrigerator. It's added to mac and cheese, pizzas , casseroles and the kids now know it it as a every day food. Garlic - I grew up believing that no other remedy would work as well on a very bad cold than garlic tea. Yuk, right?! Later on I found out that garlic can be added to any kind of hot food and its pungent and sweet flavor is just the right seasoning for almost everything. Now, living very close to Gilroy (CA), I am still in love with garlic. And this link from Web MD proves that the old sayings from Brazilian shamans might have scientific support somehow. Green Beans - Versatile, crunchy and loaded with Vitamin K, which is a regulator of blood clotting. Besides lots of other vitamins, green beans add a generous amount of fiber in the diet. Here you can read more about its properties. Oranges _ Both explorers and pirates knew its benefits, and up to now, no fruit is capable to beat the wonderful qualities of oranges. The one in the picture belongs to my very own tree! And I can guarantee that all family benefits from its goodness. Besides the well know protective Vitamin C, it has folate, lots of fiber and even Calcium. As Dr. Sears points out here it is one of the fabulous fruits for everybody - and it's higher content of vitamins is in the rind, and not on the juice so don't clean it all when preparing it for the kids. Quinoa _ This is one of my favorite super foods. Its nutty flavor is an amazing addition to many good recipes, and its protein amount is absolutely superb: about 12 grams per 100g of produce, which is quite an achievement for a plant. Also, its history is full of charm. According to the book A Cook's Guide to Grains (Jenni Muir), it was cultivated by the Incas about 5 to 8 thousand years ago and many studies consider it the ultra super food for the future. It is on our table today after the Spanish conquistadores brought it from the ancient native people. Now the scientists know why it was considered a sacred food: besides lots of protein, it brings B vitamins, and many important minerals to your plate. The one in the picture is a bowl of organic red quinoa, my favorite. Salmon _ I mostly choose the Alaskan Sockeye Wild catch. The famous Omega-3 oils are all there and latest studies show that these oils play a definite role on brain formation and healthy hearts. Usually we sear it or broil it to keep its moisture. Sweet Potatoes - Its deep orange flesh carries all the beauty of this root. Sweet Potato was found to be one of the oldest types of food in the world, and many sources suggest that its origin is Central America. The main factors that qualify it as super food: huge amount of Vitamin A (Beta-Caroten). It provides more than three times of the recommended amount for our daily diet. One of my favorite ways of cooking it? With olive oil and zaatar, as here. Yogurt _ Probiotics _ aka lactobacillus colonize a healthy digestive system - and high protein are the very well know properties of this lovely Make it With Milk product. 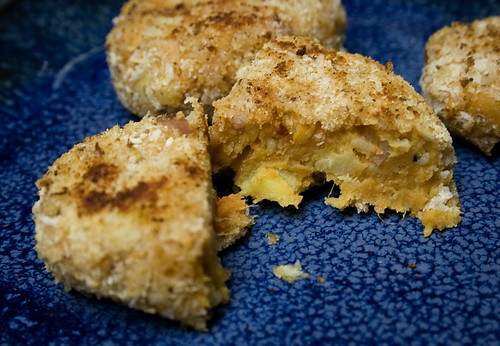 Here we have a wonderful recipe to produce yours : Darienne has mastered the art of preparing it. My mother can turn out beautifully formed breads, elaborately frosted cakes, perfectly crimped pie crusts. My baked goods tend to be misshapen and listing, if not actually collapsing. Thankfully they taste better than they look. 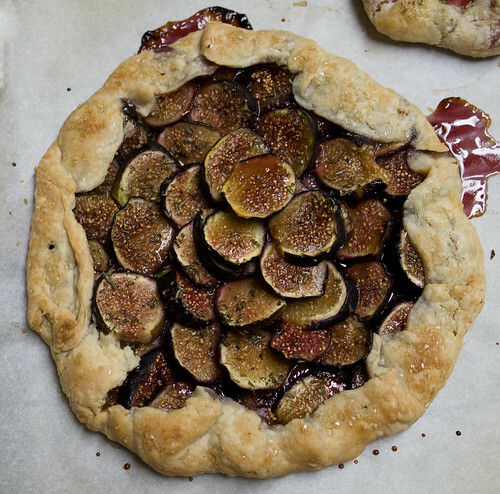 Galettes -- simple free-form tarts -- are the perfect dessert for the imperfect baker. They're quick, easy, and adaptable. Stockpile some dough in the freezer, be it Pillsbury pie crusts or homemade pâte brisée. When you're in the mood for pie but not for fussiness, pull a hunk of dough out of the freezer, roll it out, top it with whatever fruit's in season, and stick it in the oven. Voilà -- a fresh, elegant, and delicious dessert. Using enough dough for half a single-crust pie yields a small galette, just the right size to devour after dinner without leftovers tempting you for days. 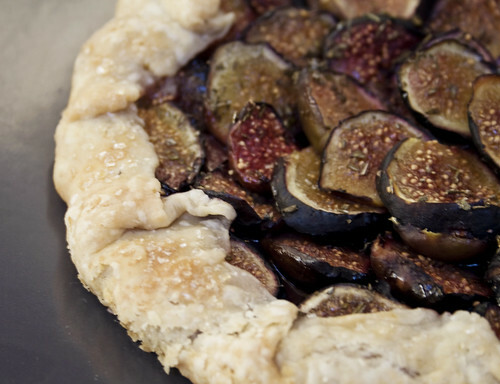 This one combines figs, rosemary, and honey for a savory fruit pie. Tomorrow I'll have another galette capturing a last burst of summer flavor. This makes a modestly sized galette, enough to serve six. If you want a larger dessert, double the recipe. Preheat oven to 400 degrees. Warm honey briefly in the microwave so it pours easily. Line a baking sheet with parchment paper. Roll out dough into a roughly 8" round or square and set on the parchment paper. Lightly brush dough with honey, setting aside remaining honey. 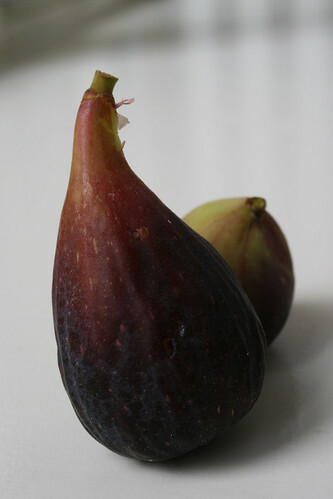 Lay out fig slices in the center of the dough, leaving a 1 1/2- to 2-inch border. (With a round, you can invert a bowl in the center and press lightly to mark where the fruit will go. With a square, try marking the corners with pieces of fruit.) Drizzle figs with remaining honey and sprinkle rosemary on top. Carefully fold up the edges, pleating where necessary. Don't worry about making it too pretty! 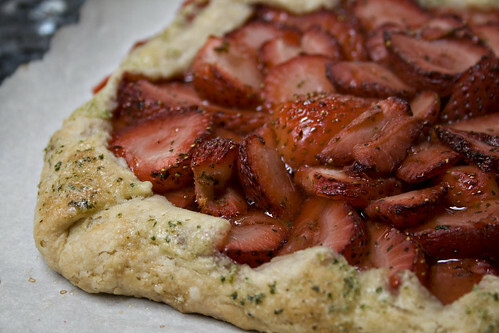 Lightly brush the edges of the dough with water and sprinkle with sugar. Bake for 20 to 28 minutes, until dough is golden brown and crispy. This makes enough for one double-crust pie, two single-crust pies, or four small galettes. It freezes perfectly: Just thaw on the counter for an hour before using. Combine flour, salt, and butter in the work bowl of a food processor, and pulse until the mixture resembles coarse meal, about 10 seconds. If there are big chunks of butter let, pulse a few times more until the butter bits are about the same size. With machine running, slowly pour ice water through the feed tube -- start with 1/4 cup. Pulse until the dough holds together and isn't too wet or sticky. You don't want to process it for more than 30 seconds or so. If you can squeeze a small amount together, it's done. If it's still crumbly, mix in a spoonful of water at a time with your hands. Divide the dough into two equal balls and wrap them in plastic. Chill in the refrigerator for at least an hour. Flatten each ball into a disc and wrap in plastic, then chill in the refrigerator for at least an hour before using. As Darienne pointed out in her post last Monday, it is very important that the kids get some fun when opening their lunchbox, and are somehow proud and surprised about the goodies they may find in their box (bento or thermos) to avoid comparisons and boredom. I love the idea of including stickers or a treat, and also love the small plates idea. 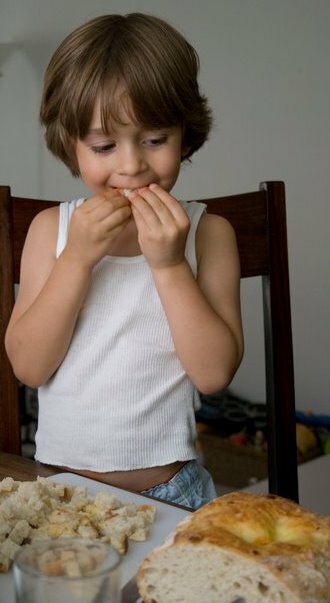 After dedicating some time to sit and talk with my son about the options, I remembered an old favorite in our home that might work well with our best intentions: tapas. So here follows an interpretation of one of my favorite tapas I had in Spain and find to be a good option, as it can be served hot or cold. My plan is always to send it in the box with toothpicks so that my kindergartner will find it irresistible. I mainly like to use Omega-3 cage-free eggs, which I find to be really a good choice. Also, I added just a touch of smokiness in the recipe, but it is really not needed, with micro-bits of bacon or salmon. Also, to make the process really easy, I bake the potato in the microwave the night before, so that it is all ready to be prepared in the morning rush. I use organic red potatoes, as they have a better texture for the omelette and can be fried with the peel on, keeping their fiber and vitamins. Heat olive oil in a medium skillet. Add bacon (or smoked salmon) and onions and fry them over low-medium heat. Add potatoes and make them crisp, frying each side for about 3 minutes. Add beaten eggs and close the skillet with a loose lid, plate or even another skillet over low heat for about 4 minutes. Open pan, making sure that the all eggs are cooked. Now you can turn the omelette with the help of the other skillet or with a spatula to make sure both sides have the same texture. Wait a few minutes so the omelette doesn't deflate, and when it's almost cold cut it in squares or your kid's favorite shape with a pizza cutter. Back to School Lunches: What to Pack? As parents who are passionate about food, we want our kids to eat at school as well as they do at home, and making that happen is not always a piece of ... ahem ... birthday cake. Below, we offer some food for thought and an abundance of ideas to help inspire creative, fun lunches. 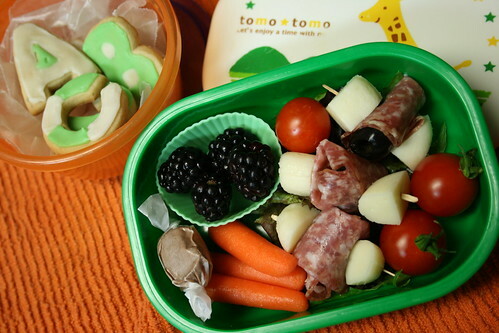 First day of school lunch: ABC cookies, blackberries, cherry tomatoes, carrots, a piece of taffy, and skewers with salami, cheese, and olives. Packing your child's lunch isn't just about providing nutritious food to fuel him for a full day of school. It's a strategic, competitive process. Give some thought to what principles you'll fall on your sword for, and what you're willing to concede. Darienne's concession: I always include something my son will see as a treat, something school doesn't sell and the other kids don't have. It could be a piece of salt-water taffy or a tiny container of balsamic vinegar and olive oil for dipping bread. 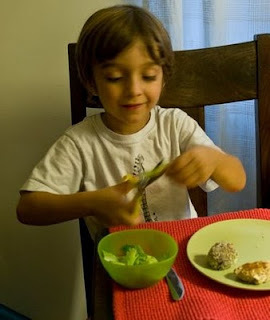 Anna's idea: My older boy starts to have lunch just in November, so we are working on a monthly menu with pictures and options. The idea behind it is to give the almost-6-year-old the power to choose. One day of the week he can choose "Mystery Lunch" to be surprised. Ask your child about her lunch after school. What did you like? What didn't you like? Why didn't you eat the pickle? I thought you loved pickles! What did other kids have? Many kids complain they don't have enough time to eat. Make sure everything is easy to get to -- clementines are peeled, for example, and extra packaging is minimal. Perhaps use a small reusable container for milk or water. When Darienne sends juice, she packs a box because her son can't always find an adult to help with the trickier juice pouch. Anna also plans to send juice boxes. Because her family is reducing juice to once a day, he knows the box is to be enjoyed with his lunch -- taking advantage of that fact that he is very hungry at school and a box of juice won't ruin his appetite. 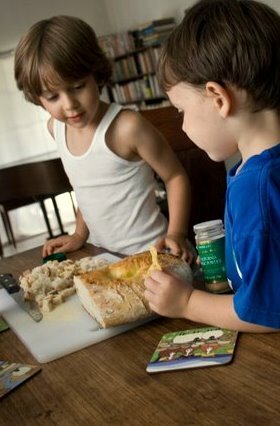 When your child gushes about someone else's lunch, steal some good ideas or have a conversation about food. Avoid disparaging a classmate's junk food, but do have a positive conversation about how the food in your child's lunch bag helps her grow and become strong. 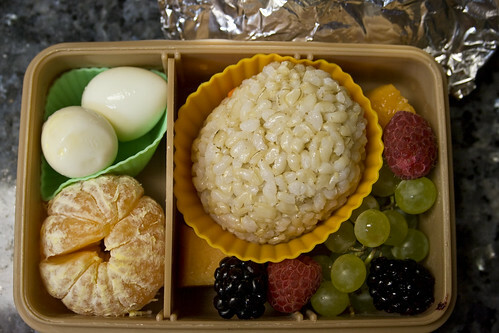 Tiny food: Quail eggs, a clementine, onigiri, blackberries, melon, raspberries and champagne grapes. Small bits of food are quick to eat, and they allow more room for variety. When Darienne packs a full-size sandwich and an apple, she typically sees both come back home nearly untouched. If she packs several tiny things, nearly everything gets devoured, or at least sampled. 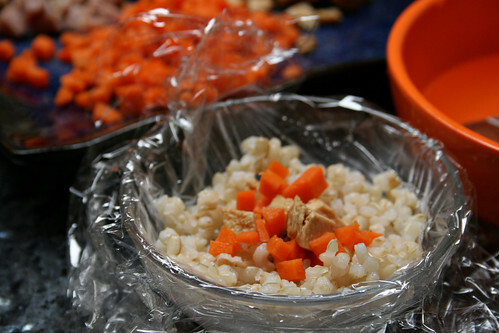 Asian markets and stores are great resources for small, packaged foods and containers to put it all in. 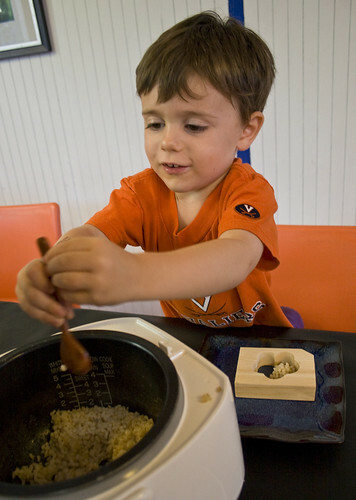 One idea is to study some small plates dishes and finds which ones are your kid's favorite flavors and textures. Buying lunch at school is a Very Big Deal for a young child. Letting kids buy lunch -- maybe once or twice a week -- might make them more agreeable to home-packed meals the rest of the week. Give them something to smile about. Darienne's first-grader was excited to show off polka-dot fruit roll-ups, which he is proud to have inspired over at Fix Me A Snack. Make all the food the same color, draw a funny face on a marshmallow with a food coloring marker, or tuck in a sticker. Your kid will love it. dried fruit, including raisins, apricots, mango, prunes, roll-ups and strips, etc. For variety, look for less-common options, like banana chips and dried hibiscus flowers. What are some of your favorite foods to pack? S'mores are a thing of beauty: warm marshmallow oozing over melting chocolate, held in place -- barely -- between two crisp graham crackers. Pure sugary heaven for a kid; as a grownup, however, I enjoy one and then I'm done. But I fell in love with s'mores all over again thanks to my friend Melissa, who blew my mind with a full smorgasbord of s'mores options. Lemon meringue pie in s'more form was a revelation. 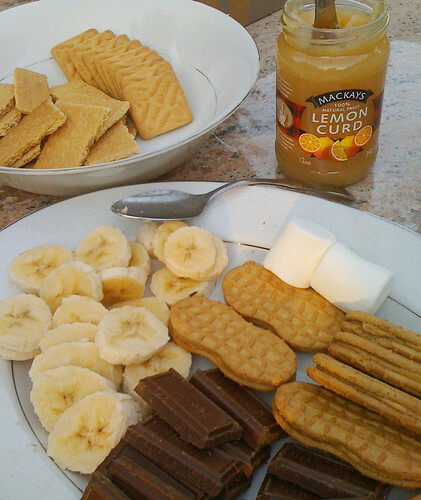 And the peanut butter, banana and chocolate s'more sent me over the moon. I can't believe I hadn't heard of these before. If you've been similarly deprived, I'm revealing all right here -- just in time for Labor Day cookouts! Toast marshmallow over fire or grill. 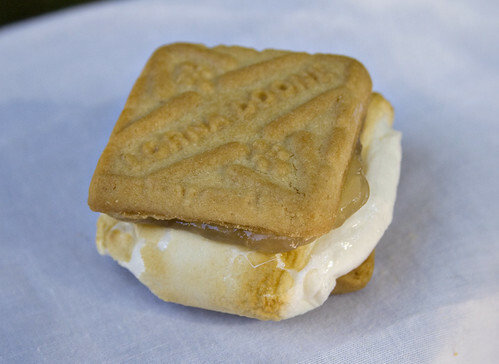 Spread lemon curd on one cookie, add toasted marshmallow, then top with second cookie. Use any of the following toppings that make you happy. All of them in one s'more made me very, very happy. 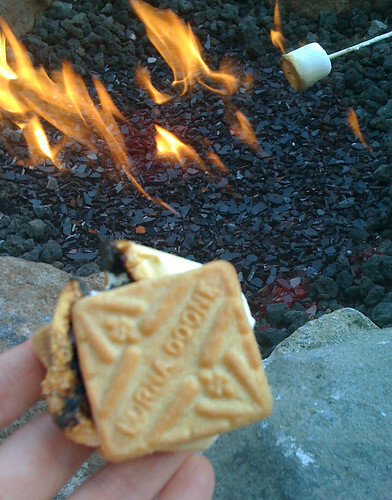 Toast marshmallow over fire or grill. Put banana slices on one cookie, add chocolate square, then toasted marshmallow, then top with second cookie. 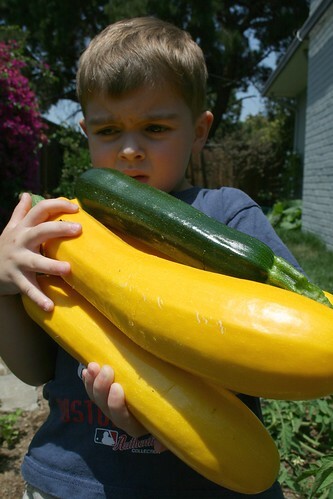 Last post by Darienne was a delightful example of how to give a little help with kid's appetite for veggies. I am also a believer: If you offer them veggies at the right time and with a beautiful presentation, they will eat it. Add to that the few years that all of our kids have been seeing trays full of veggies besides cookies trays in birthday parties and playdates. That was also certainly a big step towards familiarity with the greens and colorful edible plants. Here in my kitchen things are somehow different, so that Darienne's solution will probably take a special momentum to work - my kids rarely beg for food even when very hungry. I mainly have to call them 3 to 5 times before they come to the table. And when they start eating, they do their job with some interruptions, mainly to play or to annoy each other. So I mostly cook in peace. And eat ...ahem... in a not so peaceful mood. The way I lately found to awake their appetite for more greens (mainly because the greens are the ones they may separate in their plate) was to start talking about salads an veggies as I would talk about chocolate. And also I started eating my lunch with tons of greens on my plate, in front of them, and could not stop giving the best review about what I was eating. Yummm, how delicious... etc. 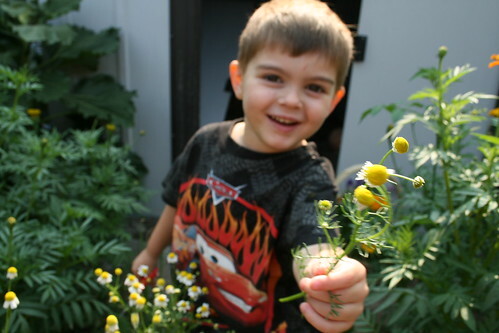 It took me one week to convert the 5.5- and 3.5-year-old boys in occasional salad eaters. Last weekend, for an instance, they were thrilled to try salad for "grown-ups" at my favorite local pizzeria. A simple version of a Caesar's salad came all pretty in a nice bowl and the bites of croutons made my task easy. They found out that the fresh romaine lettuce was as crunchy as the bits of toasted garlic bread, and the Parmesan cheese also was a great note to attract them. When pizza arrived they were so happy - they ate their salad and were stealing cherry tomatoes from their dad's House Salad. I also include veggies in their favorite dishes. Fresh zucchini, broccoli and spinach always appear mingled with pasta, meatballs or meatloaf. They can see them all, nothing is hidden or over-processed to be acceptable. When very inspired and having more than the usual 20 minutes to cook, I can do what I used to call "colorful" rice. 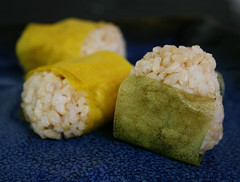 The irresistible rice has lots of different colors in it, and they eat all of them. What we have here is a kind of cute mix of colors, but you can do with whatever fresh is in your fridge. Rice and scrambled eggs always have been a quick choice for me when I was a kid. 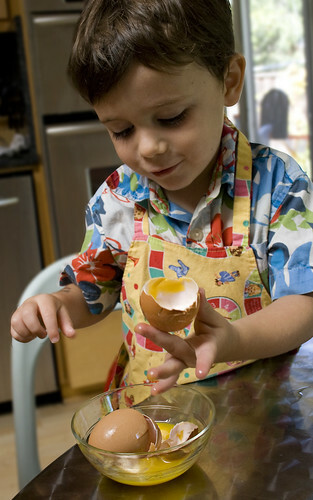 Also kids can help you to cook it, stirring throwing the ingredients in the skillet or even chopping them with a Progressive knife. Heat oil in a skillet and sauté your choice of protein and stir-fry all veggies. Set them aside, in a corner of the skillet. Add eggs and scramble them. 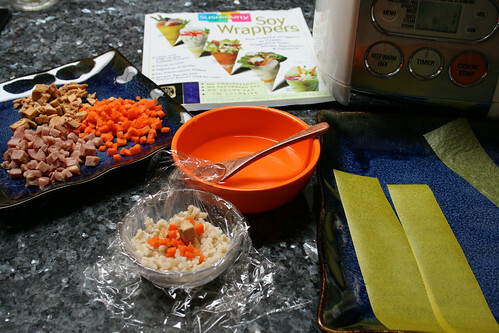 Add rice and mix all to a colorful pattern. Serve in a bowl with spring onions and tomatoes on top.